March 24 at 4:37 p.m.
March 22 at 6:41 a.m.
March 7 at 2:32 p.m.
Android is now the most-used smart phone operating system in the United States — a stunning race to the top from a platform that didn’t exist 25 months ago. Feb. 14 at 5:41 p.m.
Research In Motion, maker of the BlackBerry smart phone, will release its PlayBook tablet computer on two more high-speed network standards in the second half of 2011, the company said Monday. Jan. 31 at 6:34 a.m.
India rejected on Monday Research In Motion’s offer to allow it only partial access to its BlackBerry data services as neighbouring Pakistan also moved to restrict the popular smartphone’s services. Jan. 6 at 12:26 p.m.
Research In Motion Ltd. reiterated Thursday its plans to release the Wi-Fi-only version of its PlayBook tablet in the first quarter of calendar 2011. Dec. 29, 2010 at 6:30 a.m. If Research in Motion’s BlackBerry PlayBook is to succeed at market the way the company hopes, there are a few engineering hurdles to overcome. The most significant, according to Kaufman Bros. analyst Shaw Wu, is the device’s relatively poor battery life. Dec. 16, 2010 at 4:26 p.m.
Research In Motion reported results that mostly beat expectations Thursday, and the BlackBerry maker forecast strong profits for the current quarter, pushing its shares higher in after-hours trade. Nov. 10, 2010 at 1:37 p.m.
BlackBerry maker Research In Motion, a late entrant in the tablet computer market, will take on Apple’s iPad with competitive pricing of its PlayBook. 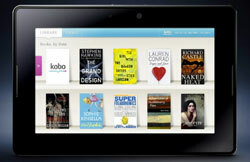 RIM, which said it will sell the PlayBook for less than $500, is confident the 7-inch tablet would help sustain “fast sales growth,” said RIM Co-Chief Executive Jim Balsillie. RIM’s Nasdaq-listed shares jumped more than 6 percent on Wednesday to as high as $58.72, their highest since June. Nov. 10, 2010 at 11:49 a.m. Global smart phone sales nearly doubled in the third quarter, and Apple is now one of the top five bestselling manufacturers. Nov. 5, 2010 at 11:33 a.m.
Sep. 27, 2010 at 5:32 p.m.
An image provided by Research In Motion showing the new Playbook. 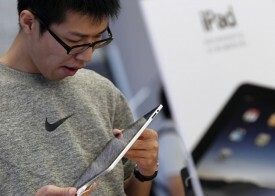 Research In Motion unveiled a tablet computer on Monday that it hopes will leapfrog Apple’s iPad with its potential for social networking, media publishing and corporate uses. 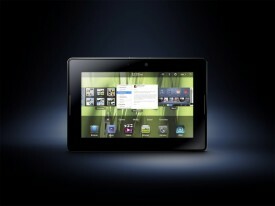 The tablet, named BlackBerry PlayBook, has a seven-inch (18 cm) screen and dual facing cameras. It has WiFi and Bluetooth but needs to link with a BlackBerry smartphone to access the cellular network. Sep. 22, 2010 at 6:34 a.m.
BlackBerry maker Research In Motion Ltd. could unveil its new tablet computer — as well as the operating system that will power it — as early as next week at a developers’ conference in San Francisco, said people familiar with RIM’s plans. Sep. 10, 2010 at 1:36 p.m.
Google Inc.’s Android software will become the world’s second most popular operating system for cell phones this year, leapfrogging offerings from Microsoft Corp., Research in Motion and Apple Inc., according to a new report. Sep. 1, 2010 at 5:26 p.m.